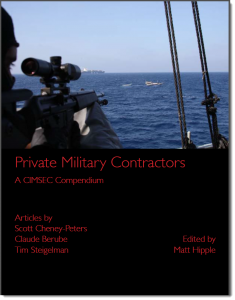 CIMSEC is proud to present the first publication in its series of collected analysis – our Compendium to last year’s Private Military Contractor (PMC), focusing on the role of PMCs, also known as Private Military Security Companies, in the maritime domain. As a multinational community of strategists, researchers, and practitioners, the Center for International Maritime Security strives for a clear, relevant, and quick response to the issues facing international security. 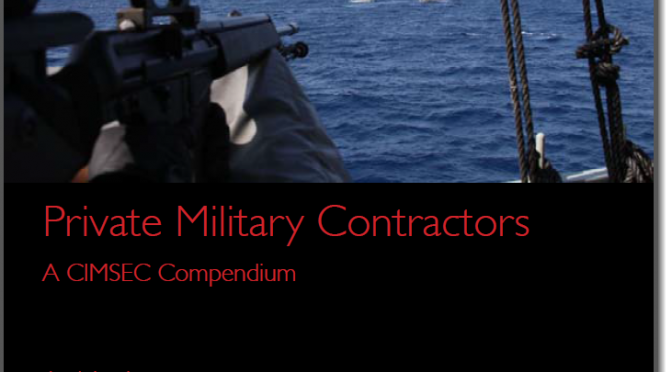 To that end, CIMSEC is publishing collections of its focused articles in PDF format. This allows for quick distribution of diverse opinions on the topics that of relevance to maritime security today. For those who prefer browsing, the articles remain on the website under their respective categories. By organizing and distributing our authors’ analysis in multiple ways, CIMSEC is steaming ahead with the maritime policy-maker in mind. Credit is due to all CIMSEC members – both contributors and those who share their insights through our informal collaborative channels and make such projects possible. In particular, this series is the work of Chris Papas, Director of Publications, under the guidance of head editor for the project, Matt Hipple, Director of Online Content and the head editor for this project.